You know those moments at the supermarket in the dairy product aisle when you reach for a milk carton and notice they have 1% and 2% milk? Did it ever puzzle you as to what these percentages were referring to and if they actually made any difference? What exactly is the difference between 1% and 2% milk? 1% milk is milk with 1% fat. We call this low-fat milk. Once processors collect all the milk from cows, they remove the fat. 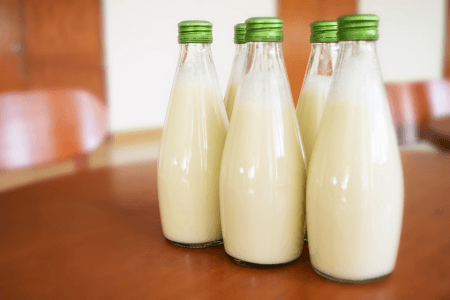 This way, the milk does not turn into cream during the process of pasteurization (milk sterilization). Also, fat percentages in the milk collected from cows can vary according to factors such as time of year, the type of grass eaten by the cow and how long it has been since the cow was milked. Since producers need all milk to have the same taste and same amount of fat, processors skim it all. They introduce it later to select batches. 1% milk contains a final concentration of 1% fat. One cup of 1 percent milk has 102 calories and 2 grams of total fat. It has plenty of vitamins and minerals (like thiamin, riboflavin and vitamins A, D, E and K) and makes a great low-fat calcium source. 2% milk is milk with 2% fat, meaning that the skimmed and pasteurized milk in one specific batch has fat added to a final concentration of 2%. It is referred to as reduced-fat milk. As a result of the fat content, its taste resembles that of whole fat milk. One cup of 2% milk has 122 calories and 5 grams of total fat. 2% milk has the taste of whole milk without as many calories. So what is the difference between 1% milk and 2% milk? Both 1% low-fat milk and 2% reduced-fat milk are low-fat options compared to whole milk, although 1% is lower in fat content than 2%. A 2% fat composition gives the milk a taste that resembles whole-fat milk, while 1% milk is more similar to skim milk in taste. Both of them are full of nutrients and vitamins. One cup of 1% milk has 102 calories, whereas the same amount of 2% milk has 122 calories. The choice between the two depends on the number of calories and on various health issues which call for a reduction of fat in all sorts of food.